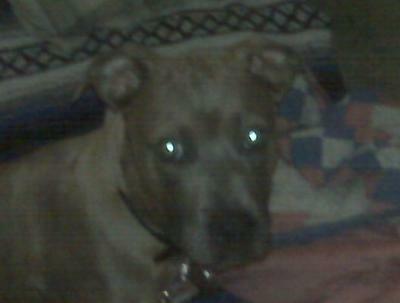 Hi, I am a Pit Bull and my name is Emira. My name means Princess in Arabic. 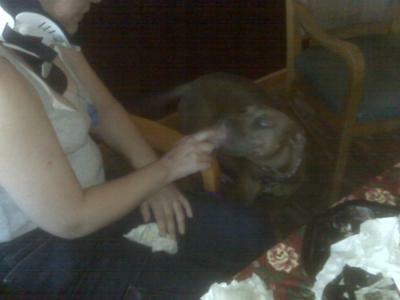 I was born in December 2009 and met Samantha, my mistress, and the family when I was 7 weeks old. 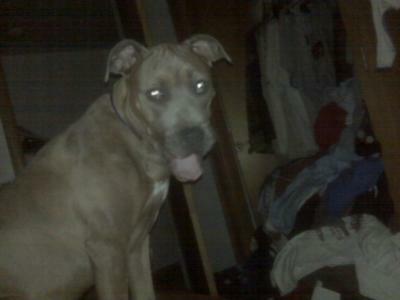 When I came home my dog pack consisted of Cleo (Pit Bull Beagle Mix), Flash (red-nose APBT and Alpha) & Zena (German Shepherd) but Cleo was put down as she was a mean dog. My Humans are pretty cool. A few weeks after I came home to my family, my mistress was in a bad car accident and grandpa (pop-pop) was the one who trained me and held me when I was missing my mom. When Sam was in rehab, I got to go see her a lot. I love to shake my whole body from the tip of my nose to the tip of my tail which I am told can make even Pit Bull haters lean down for a kiss. I love to go to the Rehab hospital and visit with people even though my mommy has been home for a while. 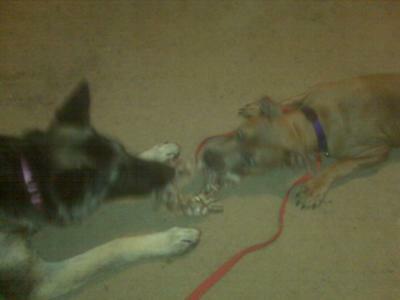 I have a new Brother, his name is Gunner and he's a 7 month old German Shepherd. He and I are really great buds. Together we dig trenches in the back yard that really bug Pop-Pop but he doesn't yell... He fills in the holes and we dig them out again later. Its our game. The German Shepherds like to herd me and, in turn, I get to make them run and run and run!